The Shell Make Money story stretches back several decades. It is a story of spectacular success in terms of a sales promotion catching the public and media imagination, while also generating a huge boost in gasoline sales. Unfortunately the behind-the-scenes story is not so rosy, with Shell engaging in prize-rigging, deception and outright treachery. 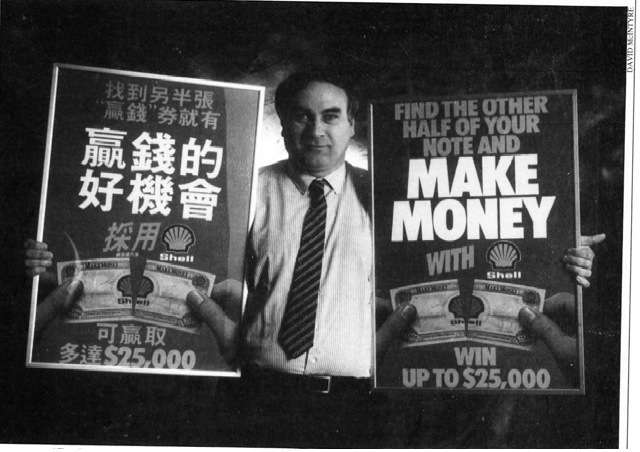 The Shell Make Money story stretches back several decades. It is a story of spectacular success in terms of a sales promotion catching the public and media imagination, while on two occasions also generating a huge boost in gasoline sales. Unfortunately the behind-the-scenes story is not so rosy, with Shell engaging in prize-rigging, deception and outright treachery. 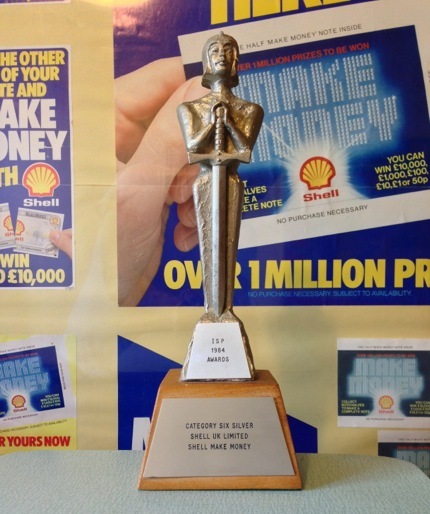 Many promotional experts believe Shell Make Money was the most successful sales promotion ever conducted. Don Marketing, the sales promotion company I co-founded, won an ISP Award for the 1984 promotion. 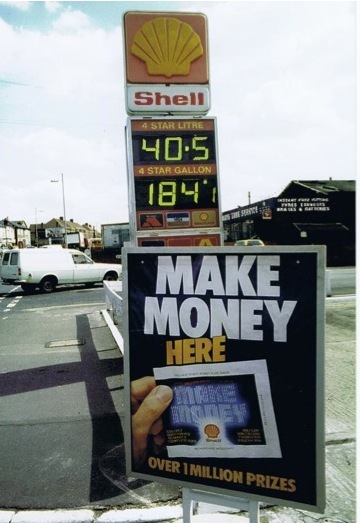 In an article entitled “Promotions that shook the Millennium,” published in the June 1999 issue of Promotions & Incentives Magazine, Shell Make Money was voted by sales promotion professionals as being the “Promotion of the Century”. The following are extracts from the book “Beyond Redemption: THE FIRST EVER HISTORY OF SALES PROMOTION” authored by Colin Lloyd and Ken Spedding. Colin Lloyd is President of the Institute of Sales Promotion (ISP). Ken Spedding is an ISP Fellow and former ISP director. By contemporary standards the Shell promotion was pretty basic. 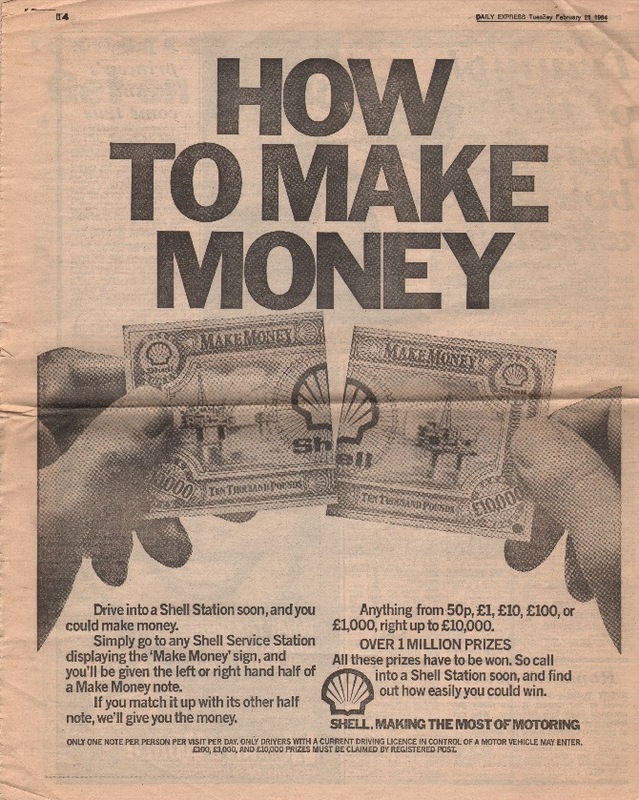 When you went to a garage and bought petrol you were given an envelope containing half a mock banknote with various values…”Â “In order to win and ‘Make Money’ you had to obtain both matching halves. The promotion took the country by storm and did wonders for Shell sales. It got massive media coverage, was a talking point whenever people met and best of all for Shell, id did wonders for its sales, giving a massive increase in market share. A number of experienced SP professionals, including the authors of this book, consider it the most important promotion in recorded history. Colin Lloyd made a similar comment about Make Money in an article he authored for Campaign magazine published on 5 January 2009 under the headline: “Sales promotion in the 70s – you couldn’t get away with it now”. Under the section “The golden age” he again named Shell Make Money as his number one favourite. I have a unique perspective, having insider knowledge of all three versions of Shell Make Money run in 1966, 1984 and 1994. The original Make Money concept was devised in the 1960’s by Ralph O. Glendinning of Glendinning Associates, an American marketing consultancy. Shell UK launched the game on 21 July 1966. A full page advert from the Daily Express published on that date is displayed right. It is normal and proper to ensure all prizes in a promotional game are fairly distributed geographically. This basic ethical requirement was flouted. Instead Shell rigged the prize distribution so that more top value prizes were seeded into game pieces in the South East, including London, at the expense of Scottish drivers. Furthermore, the big prizes were deliberately seeded into games pieces given out at larger gallonage sites. So if you were a Scottish driver purchasing Shell petrol at a small local outlet, the chance of winning the advertised top prize was just about zero. The innovative promotion proved to be a short-lived spectacular success after Shell stations ran out of game-pieces. Shell had miscalculated the number required. Furthermore, there was a question-mark over security of the game-pieces imported from the USA. There was also considerable anxiety over the legality of the game with concern about a possible intervention by the Director of Public Prosecutions. 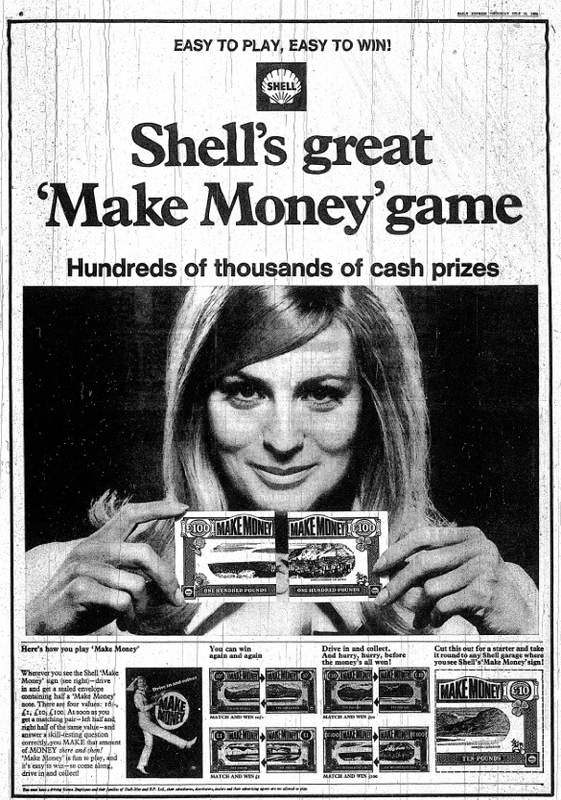 I approached Shell in early 1980’s presenting a secure and legal format for a Make Money game that could be safely printed in the UK. My company, Don Marketing, supplied Shell with a legal opinion from Jarlath Finney QC, a leading specialist in the Lotteries & Amusement Act. As Shell paid some of the development costs, we agreed in writing to share proprietary rights to the concept on a 50/50 basis. In other words, we jointly owned the rights with Shell. The game was such a spectacular success that we run it for Shell in a number of overseas markets and won an IPS Award in the UK. By 1994 a particularly cut-throat bunch of people were running Shell UK Limited. The executive in charge of National promotions was ruthlessly ambitious, recording in his diary an intent to set up a business inside Shell and retire by the age of 35. He had a special relationship with a promotions agency and an offshore bank account. He rigged a tender for a major promotion and the contract was awarded to that agency even though they did not participate in the tender. This was like a horse winning a race in which it never ran. Ideas that third parties had presented to this Shell executive in confidence were all channeled to the same agency, including promotions we proposed. While I was already taking issue over a Nintendo gameboy themed instant win promotion Shell had launched, the Shell executive in question raised the subject of Shell Make Money and said Shell could run it without us. I offered to let him have sight of the original written agreement between Shell and us. He said that he was not interested in seeing it. Alerted by then to his predatory nature and despite his assurances that nothing was going on, I checked with an insider source and discovered that millions of Shell Make Money game pieces were being printed by that same printer we had used. We immediately issued a High Court Writ seeking an injunction and Shell was forced to settle. Incidentally, Shell also later reluctantly settled three further high court cases we brought against the company for stealing our ideas. All involved the same dishonest Shell executive, who had been backed by senior management, despite being made fully aware of his dishonesty. This was a pack of lies. We have Shell letters and taped telephone conversations, which prove that Shell executives knew about our rights to Make Money and deliberately chose to secretly move forward with their plans without involving our company. Unfortunately for Shell we caught them in the act and immediately issued High Court proceedings. Shell settled because it was forced to do so. To our astonishment, when Shell launched the 1994 version of the Shell Make Money game we discovered that the game pieces were insecure. In an unusual meeting at our Fleet Street solicitors Royds Treadwell, attended by Shell internal and external lawyers, including Nigel Rowley and a senior partner of Royds, Mr Richard Woodman, a colleague and I identified the supposedly hidden content of the first 9 out of 10 game piece envelops inspected, and then guaranteed 100% accuracy in picking out the winners. This meant that dishonest forecourt staff with access to stocks of game pieces could extract all of the rare half-notes (effectively removing all winners) leaving drivers with no chance whatsoever of winning any prize. We did not disclose this situation to the news media and Shell continued the promotion despite knowing that the game was seriously flawed and absolutely wide open to abuse. The whole promotion suffered from a lack of expertise and fell flat. A great promotional concept torpedoed by inexperience and greed. Walkers, Coke, Tesco, Cadbury – the list of great SP promotions is endless. But P&I has narrowed it down to 50, and now it’s time to choose the all-time favourite. No doubt the arguments are breaking out already. Best SP campaigns? P&I carried out a similar campaign exactly six years ago, asking SP’s elite to name which campaigns they thought people would remember beyond 2000. In the top three were Shell’s Make Money, Heinz’s Car a Day, and John Players’ Spot Cash; in the top 20 were the campaigns we mentioned earlier – the daffodils, Walkers’ Money Bags, Green Shield Stamps, as well as Cadbury’s Faberge-like Egg Mystery and Harry the Lime. Posted in: Business Principles, Corporate Governance, Corruption, GoogleNews, John Donovan, Litigation, Royal Dutch Shell Plc, Shell.